Master of Malt sent me some samples of their new range That Boutique-y and as I happen to have some samples too myself I decided to do a super tasting of this new ramge of whiskies!. That Boutique-y Whisky Company bottles Scotch Single Malt Whiskies from a variety of renowned distilleries like Ardbeg, Macallan or Aberlour in limited batches. 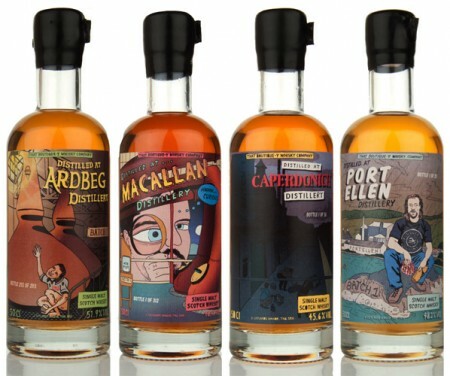 These whiskies are adorned with cultish comic-book style labels which feature prominent figures from the whisky industry upon them, as well as other little details for you to find! I have tasted several whiskies from the first batch and most of them are already sold out by the time you read this. On their webpage it is available right now a second batch of whiskies. Nose (91): more than average. honey, tobacco, vanilla, nuts, citrus. Palate (91): powerful, oily. honey, tobacco, nuts, citrus, spices, vanilla, dark chocolate. Finish (90): longer than average. tobacco, wood, citrus. Slightly dry finish. So based on other whiskies I have already tasted I rate this Aberlour - Batch 1 (That Boutique-y Whisky Company) with 91 points over 100. Palate (91): powerful, oily. honey, toffee, vanilla, spices, citrus, wood. Finish (90): longer than average. honey, vanilla, spices. So based on other whiskies I have already tasted I rate this Aultmore - Batch 1 (That Boutique-y Whisky Company) with 91 points over 100. Nose (88): more than average. peat, honey, vanilla, citrus. Palate (91): powerful, oily. peat, citrus, motor oil, spices, wood, coffee. Finish (91): longer than average. peat, citrus, coffee. So based on other whiskies I have already tasted I rate this Ardbeg - Batch 1 (That Boutique-y Whisky Company) with 90 points over 100. Nose (88): more than average. honey, candies, brown sugar, sulphur, floral. Smell slightly rum-ish. Not bad, but the more I nose the less I like. Palate (85): powerful, oily. honey, wood, fruits, spices, sulphur, cinnamon. Finish (84): longer than average. wood, citrus. So based on other whiskies I have already tasted I rate this Benrinnes - Batch 1 (That Boutique-y Whisky Company) with 86 points over 100. Nose (89): more than average. honey, varnish, spices, vanilla, citrus. Palate (90): powerful, oily. honey, nuts, vanilla, wood, spices, cinnamon. Finish (90): longer than average. honey, cinnamon, wood. So based on other whiskies I have already tasted I rate this BenRiach - Batch 1 (That Boutique-y Whisky Company) with 90 points over 100. Nose (92): more than average. honey, varnish, fruits, pears, mango, tropical fruits, vanilla. Very fresh whisky. Palate (90): powerful. honey, nuts, spices, vanilla, wood, pepper, candies. Finish (91): longer than average. honey, fruits. So based on other whiskies I have already tasted I rate this Caperdonich - Batch 1 (That Boutique-y Whisky Company) with 91 points over 100. Nose (92): more than average. honey, tobacco, nuts, citrus, spices. All that did Macallan great in a single bottle. Palate (91): smooth, oily. Honey, nuts, wood, tobacco, citrus, spices. Finish (90): longer than average. honey, tobacco, wood. So based on other whiskies I have already tasted I rate this Macallan - Batch 1 (That Boutique-y Whisky Company) with 91 points over 100. An awesome range of whiskies with an even more awesome labels. 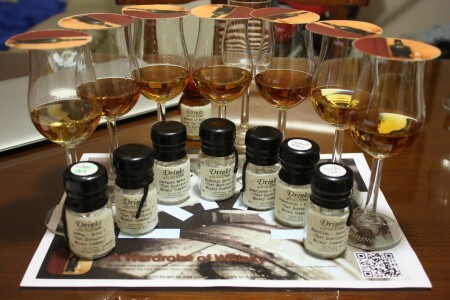 Each of the whiskies I have tasted shows really the pure spirit character of each distillery. I can’t really think about best examples than the Ardbeg, the Macallan and the Aberlour. Simply delicious. Whisky Tasting Session 2012-05: Blind fun!